It has been a long desired wish and honour to host in our digital catalogue a work by canarian sound artist Paco Rossique. Finally we can present “Caves” one more instalment on the work of this prolific and multifaceted artist. “Caves” is a site-specific inspiration album. The site in which Rossique focuses it’s flow of creativity is an archeological site on Gran Canaria Island known as the “Cenobio de Valerón”. Underneath a 30 m tall natural stone arch and above 300 m from the sea level 350 cavities where excavated on the rock more than 600 years ago. It’s one of the most important archaeological sites in the Canary Islands. 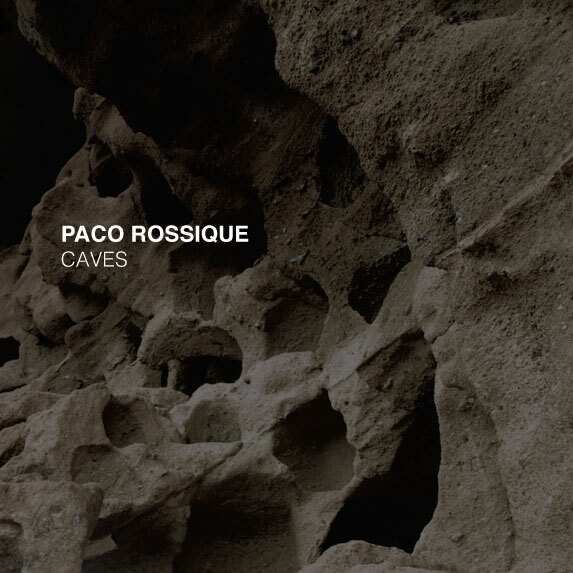 The strange beauty of those caves carved in the rock upon a cliff serve as inspiration for the 50 minute long album by Rossique. He’s been interested with the sonic properties of caves and underground architecture for a while. In 2011 his interest on this type of construction became a leit motiv by working at a 11th Century underground cistern in Alicante, Eastern Spain. Since then, Rossique has gathered recordings done on site and re-enacted sound phrases, and ambiences resembling an imaginary soundscape for those constructions. Rossique is not interested in some sort of sound archeology or certain re-enactement of prehistoric music, he’s just interested in creating his own version of it all. Caves is a procedural dialogue between Rossique and the caves. Through a process half a way from the studio and the caves itself Rossique put together different pieces of a puzzle that strangely fit. Intuition, randomness and some sort of “under control” improvisation seems to me the axis of this work. Finally you end up listening the result, a very vast oeuvre by the way, and you end up thinking that this is the work of someone having a lot of fun, engaging on a complex process free of constrains, limitations and pre-conceptions; and ending up with a complex sound universe, a very own language; something that nowadays is pretty hard to achieve. Produced and arranged by Paco Rossique in 2013. Caves by Paco Rossique is licensed under a Creative Commons Reconocimiento-NoComercial-CompartirIgual 4.0 Internacional License. Creado a partir de la obra en https://archive.org/details/at070PacoRossique.